Girl's Enameled Mezuzah Hand painted Mezuzah case by Jenji, is from the Jacob Rosenthal Judaica Collection. Enameled case is open in back for easy Scroll enclosure. 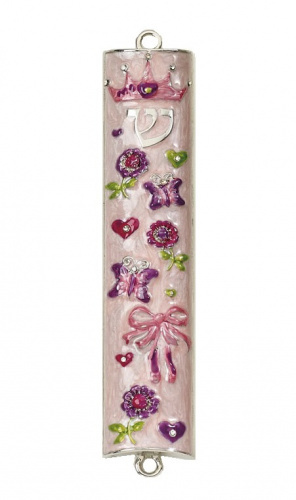 Mezuzah case is hand painted design of flowers, butterflies and hearts on a pink background. Featuring a pink crown on top.